"What did we have to worry about?" A bad dream. A long waking nightmare, complete with buzzing horse flies and weird hallucinatory insects. I was standing chest-deep in an undulating sea of flowering false hellebore (veratrum viride), the broad swirling leaves and tiny blossom tassels teeming with grasshoppers and spiders and hideous crawling bugs. The poisonous green plants crowded so closely together they squeaked as I waded through. In the pollen-sweet air fat bumblebees trundled from flower to flower. Sweat soaked my dark shirt and the dizzying sun baked my shoulders. Everything itched. Panting, I surveyed the vicinity, then studied again the GPS clutched in my sweating hand. Right here! A trail junction, a broad level campsite, and a babbling spring of sweet water should be right here! Instead, the featureless expanse of tightly packed Corn Lilies sloped for a half mile in every direction. I saw no trail. No tent site. No shade. My ear beheld no beckoning tinkle of water. From the DeLorme Topo USA map program I had religiously, perhaps obsessively, entered the GPS coordinates for a splendid campsite described in two guidebooks. It was to be our first night's sojourn. But DeLorme had misled us, and not for the first time. Its maps had also misplaced Barnhardy and Trego Hot Springs. Curse DeLorme and his inept maps! And curse me for allowing myself to be fooled again! A quarter mile down the ridge, a line of trees traced a terrace. Perhaps there I would find the trail, the campsite, the water. But the bushwhack would be an impossible drop down the steepening slope and through an impassable tangle of willows. The ground had already grown dangerously steep, and I could not see my footing in the choking yellow-green sea. If I stumbled on an unseen rock, stepped on a rattlesnake, or broke my ankle in a gopher hole, I might plunge beneath the toxic waves and never surface again. Bitterly I turned back, floundering uphill against the tide of gravity to where Barbara waited in a peninsula of forest shade. "What did you find?" she asked. Sucking lungfulls of the rarified air, unable to speak, I could only shake my head. "Maybe we should go back," Barbara said gently, as if cajoling a child. "Find out where we took a wrong turn." I bristled at the thought of retreat. Water was crucial to our endeavor, yes. We were hiking at 6000 feet along the spine of the Grayback Range. On the crest, there were no streams. Water would have to be sucked from springs and seeps, which we had carefully programmed into our itinerary. But something had gone terribly wrong. Here there was no water. A foolish refusal to retreat, I knew, can spell disaster in backpacking as in chess. Yet I resisted turning back. Instead I unfolded the old trail map, then scanned the cloying false hellebore and the dark margins of forest for some pattern of meaning. Across the meadow to the south my eyes fell on what looked like a path cutting straight down the slope at the bottom of a swath of barren ground. "Maybe that's the trail," I proposed, pointing. Barbara was dubious. "Looks like it might be just a dry wash."
"Continue downhill to the Boundary Trail junction and a large campsite at 2.5 miles. With a spring to the northeast, this campsite is the ideal base from which to explore both directions of the Boundary Trail." The dirt scar a half-mile south looked a hell of a lot like the trail we were supposed to have continued downhill on. "Have something to eat," Barbara coaxed, holding out a granola bar. I took the bar and sat heavily on a fallen log to ponder how we had gotten into this predicament. 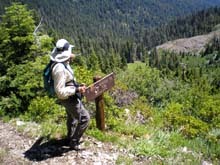 Three days ago I had telephoned the Illinois Valley Ranger Station to inquire about hiking the Boundary Trail, which runs 12 miles along the crest of a spur of the Siskiyou Mountains. From the Red Buttes Wilderness on the California-Oregon Border, the trail rambles north, then doglegs northeast, where we intended to intercept it, to Big Sugarloaf Mountain before plunging into the Applegate Valley. A helpful rangerette promised to leave a trail map for us at the Chamber of Commerce Information Center in Cave Junction, which would be open on the weekend. We studied descriptions of the hike from various guidebooks languishing on our bookshelf, pulled topographical maps out of our old map files, made photocopies, and entered relevant data into the GPS. The Primordial Scoutmaster could not have prepared more diligently. On Saturday we loaded the rented Chevy Impala and headed for Cave Junction. The man behind the counter at the Information Center handed me a manila envelope with my name on it. We did not study its contents. The fellow was helpful, confirming that the Boundary Trail should be free of snow. He sketched the route to the trailhead on a complimentary road map. After lunch we drove east on the Caves Highway feeling fine, with no clue that things were about to go wrong. Following the markings on the complimentary map, we bypassed a familiar turn-off and motored instead all the way to the Oregon Caves National Monument, looking for shortcut Forest Road 960. There indeed, just before the parking lot, lay a gravel road on the left, but it was unmarked. Or, rather, it bore a sign reading something like "Service Road" or "Employee Residences." After driving in futile circles, we decided this had to be Road 960. This shortcut turned out to be a harrowing roller-coaster ride, with incredibly steep grades, washboard ruts, and water streaming across the road. We thanked god the Impala bouncing through the woods was not ours. None of the roads were marked, but the map and odometer allowed us reasonable certainty when we dead-ended into Road 070. We turned right, looking for a junction within a mile where Road 079 would fork left and our Road 070 continued climbing to the trailhead. What could be simpler! At an open saddle we came to an unmarked junction with a primitive dirt road dropping precariously to the left and another climbing to the right. The main graveled and graded road continued straight ahead. This configuration defied the maps. There were no signs, not even the flimsy plastic paddle markers that usually designated even the most obscure spur roads. Cows meandered through the grass and brush. I drove a mile or two further, but no other roads forked either right or left. So we returned to the clearing and stopped the engine. I set up a folding chair and began entering GPS coordinates. Why didn't they mark their damned roads! As I bent to my work, curious cows closed in. A huge horned bovine bellowed from the dirt track above as it piloted a file of beeves down toward us. The GPS confirmed that this was indeed our junction (N 42 06' 42.7", W 123 23' 04.1"). Who ever heard of changing the main route numbers without a road sign? A couple in a black RAV4 pulled up and asked about the trailhead to Lake Mountain. Young, trim, and hearty, they intended to run up to Mount Elijah and back before it got dark. I was able to point out the correct cow-infested road. Crossing seven monstrous water bars, we drove the mile or so up deteriorated Road 070 until it ended at a washout blocked by massive boulders. This was our trailhead (N 42 06' 05.9", W 123 22' 43.9"). The young couple in the RAV4 were changing into running shorts and soon departed. We looked around for a place level enough to set up a tent, but the road had been carved into the mountain with a cliff on the left and a sheer drop-off on the right. There was no way we could sleep in the Impala. So we backtracked over the seven water bars and through the grazing herd to look for a place called Pepper Camp a couple of miles away. We had last van-camped at that fine old forested campsite in 1992. We found Pepper Camp at the junction of Roads 070 and 4613 , just past the Road 960 junction. (N 42 07' 06", W 123 23' 32") But it was far from fine. Into the wild and overgrown camp we trundled on an abandoned set of tire tracks. We would have been fine, high and dry on a queen-sized mattress, if we still had our van. But the van had burned (see Burning Van). So we had to pitch a tent in the underbrush. It was impossible to find a level spot. Clearing away downed branches, we erected the flimsy canvass structure on a slope behind the car and cooked dinner on the propane stove in the flattened grass in the middle of the track. This was not the beautiful campsite we remembered. After dinner we walked up a steep gravel spur road climbing west toward Buck Peak and came upon two broad level quarries that would have worked for van camping. We did not examine the maps the rangerette had taken such pains to deliver into our hands. Nor did we bother to stick her manila envelope into a backpack. Why bother? We were already familiar with the 1954 USGS topo map and the hike descriptions from our books, which I had stowed in an easy-access pocket. I had entered the DeLorme coordinates into the GPS. We were all set. Blunder upon blunder, the balance was beginning to tip. Early Sunday morning we parked the Impala at the trailhead. The RAV4 was gone. Hoisting our packs, we skirted the wash-out and followed the water-rutted road until we came to an old wooden sign announcing the Bigelow Trail. The trail grew steeper as we left the road and ascended through a forested canyon. When the valley finally opened on a broad meadow, however, we could not see a Bigelow Lake in the hummocky terrain, nor any obvious trail leading to it. So we pressed on, climbing long switchbacks through the forest until we emerged on bedrock high on the northern slope of the canyon, a thousand feet above the parked Impala. Far below lay lily-pad-speckled Bigelow Lake. Oregon Caves National Monument lay in Elijah's bowels out of sight beyond a ridge on the far side of the valley. Now the fact that our trail had bypassed the large main lake by a good half mile, even though our map showed it touching the northeast shore in the meadow, should have been a red flag that something was amiss. But we ambled blissfully on toward the saddle between Lake and Elijah Mountains. There the Bigelow Trail would dead-end into the Lake Mountain Trail, circling up from the Oregon Caves, and we would find our spur trail dropping 350 feet due east to intercept the north-south trending Boundary Trail in less than half a mile. What did we have to worry about? This would be child's play. A feeble track descended left. No doubt Meadow Mountain Trail 1214 was the fabled link that dropped straight down to intercept the Boundary Trail at the promised campsite. Not bothering to consult the maps nor explore further along the Lake Mountain trail, we plunged down the brushy path. In no more than 100 yards, the trail elbowed abruptly left, and another crudely lettered plywood sign pointed straight ahead towards "Sparlin's Cutoff." The original Forest Service trail disappeared into an impenetrable thicket of brush. Things were not right. Sparlin, whoever he was, had hijacked the official Forest Service trail. In confusion, we decided to follow Sparlin's trail northward a bit through the forest. But as soon as we emerged from the trees, I fired up the GPS. I had programmed the arrow to point to our first night's campsite. Miraculously, it was pointing straight ahead along Sparlin's Cutoff trail. We plunged onward into a meadow of grass and Corn Lilies that followed the ragged margin of the forest. As we hiked, however, the arrow began drifting toward the right. When the arrow cranked to 90 degrees, we stopped. Sparlin's Cutoff bore dead ahead. According to the GPS, our campsite lay less than a quarter mile below the trail in the sea of Corn Lilies. It was then that I lifted off my backpack and left Barbara in the forest shade to plunge into the sea of false hellebore following to a dead end the tiny arrow of the GPS. The granola bar had revived me, and I took a big drink of water. "I think I should walk over there," I said, pointing to the slash that might be a trail or a dry wash, "and take a look. I'll turn on my radio. You can guide me if I get lost." My second sortie into the Corn Lilies was as hot, buggy, exhausting, and fruitless as the first. The slash of earth could have once been a trail, but I saw no boot prints. When I tried to follow it downhill, it quickly disappeared into an impenetrable willow copse. Above the thicket a meager trail, or perhaps just a cow path, contoured back north through the Corn Lilies. Could this feeble track be the Boundary Trail? I followed it back until I found myself at the precise place where the GPS had erroneously led me before. We had wasted more than an hour searching through the meadow for a non-existent trail, campsite, and water source. We were down to less than a quart of water, and Barbara was seriously concerned about dehydration. Should we press on or go back to Bigelow Lake? The map showed the Elk Creek Trail climbing eastward to intercept the elusive Boundary Trail at an open saddle beyond Lake Mountain, maybe a mile ahead. Presumably that was where Sparlin's cutoff trail was leading. If necessary, I argued, we could drop down to Elk Creek for water or backtrack on the Boundary Trail. Maybe spend the night. Barbara was reluctant, but in the end agreed to go the extra mile. So we followed Sparlin's gently descending trail north around the eastern bulge of Lake Mountain, through pleasant woods and meadows. Just before the barren saddle, in a final clump of tall trees, we found a handsomely lettered sign nailed high on the rough bark of a stout red fir, proudly announcing "Sparlin Camp." Gray-weathered boards and flimsy plywood framed an awkward seat and bench, and a wide board had been cleated between two trees to form a rough table. Deer hunters had ridden horses here, laden with the raw materials for a shotgun camp. On the table sat a gallon plastic jug partially filled with a clear liquid we assumed to be water. Otherwise the site was dry. Fifty yards further, in a blazing waste of sharp granite talus, a rock cairn five tiers high squatted like a Buddhist stupa. Leaning against it a weathered sign marked the junction of the Elk Creek and Boundary Trails. 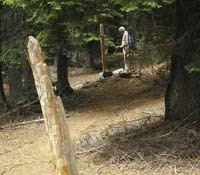 The Boundary Trail existed! We were back on the map! From the saddle the Boundary Trail continued northeast. It also contoured back southwest into the forest through patches of low manzanita and dry, brittle grass. It must have stretched below us all along, hidden in the mountain meadow of terrible false hellebore. At Sparlin Camp we leaned our packs against the rough striated bark of a red fir and rested. Quickly we disabused ourselves of the idea of following the Boundary Trail back to the lost campsite, having no desire to return to the false hellebore. We had moved beyond that. Instead, light as feathers we started down the Elk Creek Trail, carrying only our water bottles and filter. The trail was steep, and after a quarter mile with no sight or sound of water, we reconsidered. Perhaps we could filter the water in the bottle at Sparlin Camp and press on to Cold Spring. The map showed that we were already more than half-way there. How tough could the rest of the hike be? So we ate lunch in the shade, then purified the contents of the gallon jug. After slaking our thirst, we were left with a little more than a quart of questionable, tepid liquid we believed to be potable water. Barbara's lingering concern was that Cold Spring might be dry. "Then why do they call it Cold Spring'?" I responded. After a rest, we strapped on our packs and headed north on the Boundary Trail bound for Cold Spring, assuming the final three or four miles would be a cakewalk. Once again, we assumed wrong. Between Elk Creek and Grayback Mountain the trail no longer contoured around the peaks, as it had done with Elijah and Lake Mountains, but traced the ridge crest like a graph of the mountain's heartbeat, climbing each systolic summit and plunging into each diastolic canyon. We immediately began a long, switch-back ascent of the first unnamed peak. 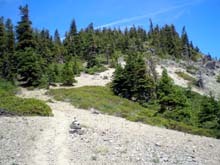 Five hundred feet above the Elk Creek saddle the trail crossed a rounded summit of gray granite bedrock and talus covered with manzanita, stands of scrubby red fir and hemlock, and snow fields. To the north loomed the granitic massif of Grayback Mountain. For over a decade we have talked of climbing to the top, and even attempted it once as a dayhike. Though visible in the distance from the Illinois and Rogue River Valleys lording over a court of lesser peaks, this was our first close-up view of the highest peak in the northern arm of the Siskiyous. At 7065 feet, its broad, double-lobed summit rose another 700 feet above us. The snow fields offered an opportunity to camp where we were and melt snow for water. Wind gusted across the ridge, but the trees offered shelter. I searched for a fire ring and a level spot to place the tent, but could find neither. The sharp gray talus paving the dome would make for tough sleeping. Over the shoulder of Grayback's right flank lay our ultimate destination. Cold Spring did not look that far away. In the end, we elected to press on. The trail dropped into a canyon, rose to cross another summit, then dropped again and rose again, gaining and losing hundreds of feet of elevation each time. We sipped at the last of our water. Exhaustion withered our spirits. After a brutally steep descent on loose dirt and scree, we finally arrived at the foot of Grayback Mountain and began a long rising circumnavigation around its eastern slopes. The map showed springs along the trail, but we found nothing we could fill our bottles from, just a few muddy trickles. Plodding like zombies, one foot in front of the other, no longer really seeing the terrain, we stumbled toward Cold Spring. 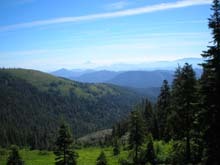 The trail crested a ridge and dropped steeply into a cove of tall red fir and mountain hemlock. A swath of meadow fell away to a lush green valley far below. From beneath the trail a small rivulet of water emerged and spread over the verdant slope. 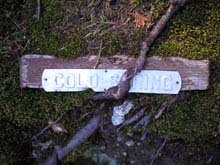 We had finally arrived at Cold Spring (N 42 06' 32", W 123 18' 19"). The trees, bent at their bases by winter snows, arced up from the steeply tilted slope, which dropped down to the O'Brien Creek Valley. Wearily we dragged off our backpacks. It was 6 o'clock, and the sun had long ago set behind Grayback Mountain. Cold and hungry, we shivered in our sweaty garments, too weary to do much about it. Barbara untied the water bottle and knelt at the spring below the trail. Set in the bank above was a metal sign that read, "Cold Spring." The water trickling from a mossy hole was too shallow, so she scrabbled down the hillside to find a pool deep enough to fill the jug. I hunted for a spot level enough to set up the tent. But nothing was level. Not even the trail. I surveyed up and down the steep slope, meeting Barbara as she scrambled back through the brush with a half-filled jug of water. In low-blood-sugar desperation, I whined, "We can't stay here!" "We have to stay here," she snapped, "where there's water." She brushed past, then wheeled on me. "Where do you want to go?" I had no idea and waved generally toward the valley below. "I'm not hiking down there. I'll stay here by the water." The site was a mess. Among the massive trunks lay a long-abandoned rock fire ring, half buried in limbs, duff, and debris. That was the levelest place.So I cleared away the branches and began pulling up the big rocks from the upper edge of the ring and rolling them down to the narrow ledge of a spur trail just below. The lower course of rock I left as revetment. Then I dragged the duff and scraped the loose soil down to level the spot. It turned out better than I expected. Our heads would be uphill, and we would probably slide in our sleeping bags, but we could always squirm back uphill like grubs in the night. Barbara had pumped fresh, cold water. We drank deeply, then she collected and pumped some more. Changing into dry clothes improved our spirits. We erected the tent. With a trowel I scraped away the duff and built a small new fire ring where I had rolled the rocks, and soon our pot of water was steaming over a crackling fire. Dinner improved our spirits even more. We had intended to climb about a thousand feet in three or four miles and camp leisurely at the unfound campsite. Instead, we had trekked eight miles, climbing and dropping a total of maybe three thousand feet. A bit much for an old couple. As the fire crackled and twilight settled over the valley, however, we could not but conclude that all was well. That night we slept like hibernating bears. The air was cooler on Monday morning, but the weather forecast no longer threatened showers. 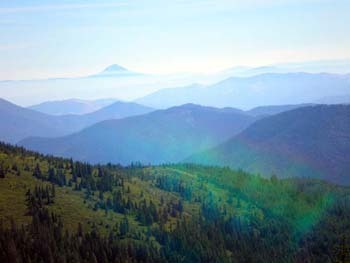 We occupied a stunningly beautiful spot on Grayback Mountain, with long views of distant purple peaks floating above fog-shrouded valleys to the north and east. Mt. McLoughlin's peak tickled the belly of the sky. When the sun rose, golden sunlight streamed into our camp from across the verdant valley. We sipped tea and mocha from our hammocks and silently celebrated our good fortune. We eyed the Boundary Trail where it continued north from Cold Spring, emerging from a grove of short red alders and crossing an open slope lush with wild currant, bunch grass, and a riot of wildflowers. A few incense cedars joined the red and white firs dotting the otherwise treeless slope. In less than a mile it circled back into the woods to a saddle that we judged to be Windy Gap, then on to the cinnamon bulk of Big Sugarloaf Mountain. We decided we might just take a leisurely stroll over there for lunch. Late in the morning we headed out. The trail squished across a boggy meadow, contoured across Grayback's open profusion of wildflowers, and quickly brought us to a signed junction with the O'Brien Creek Trail. Through the binoculars we could see the abandoned buildings of the old Krause homestead below. Years ago we had hiked that far from below in an attempt to climb Grayback, but had been stymied by the deep snow burying this trail. The Boundary Trail reentered the forest, and the sound of cascading water grew until we crossed above a substantial spring that was the source of O'Brien Creek. 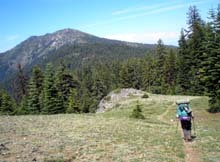 Windy Gap was an open saddle between the forested northern slope of Grayback Mountain and manzanita-choked Big Sugarloaf Mountain. The trail wound up through gray talus, granite sand, prickly manzanita, and bunch grass to a rounded summit of weathered rock. We stood on the northernmost peak of the Grayback Range. Before us lay a spectacular vista overlooking the Williams Valley, with its hazy patchwork of agricultural fields. Far to the north we identified Mt. Thielsen and the peaks ringing Crater Lake. Turning clockwise, we saw Mt. McLoughlin, Mt. Shasta, and the twin horns of the Red Buttes far to the south. The entire course of the Grayback Range lay out before us. Directly across to the southwest loomed the bald pate of Grayback itself. A lingering snowfield curled like pursed lips above its beard of forest. Back in our hammocks, we realized that Windy Gap was not visible from our camp, because of Grayback's bulge. We were looking instead at the saddle between Sugarloaf Mountain and its lesser twin to the east. Our second night at Cold Spring passed as pleasantly as the first. We had neither seen nor heard any other human since leaving the car. On Tuesday morning we broke camp early and hiked up out of the Cold Springs bowl. At the top of the ridge, within a quarter mile of our campsite, we found a huge bear print in the trail dust. Round as a cantaloupe, it engulfed a footprint Barbara had left on the way in. Good thing we had hung our food. The hike south along the crest was slow and beautiful and seemed easier than we remembered, because we knew what to expect. We were fresh and rested and our packs lighter, even with two extra quarts of water. At the unnamed snowy peak we ate lunch and again considered staying the night at the top of the world, melting snow for water. The views were magnificent. We even found an abandoned campsite in the trees about a quarter mile back beside another patch of snow. But the weather had begun to look unsettled, and Barbara preferred to camp at Bigelow Lake and watch birds. It turned out to be the right choice. At Elk Creek we left the Boundary Trail and retraced Sparlin's cutoff back through the meadow of false hellebore to the junction with the Lake Mountain Trail. Easing off our packs at the saddle junction, we tried to figure out where we had gone wrong two days earlier. Clearly visible from where we stood, not more than a hundred feet further down the Lake Mountain Trail, another trail junction bristled with Forest Service signs. We had not seen them on the way in simply because we had not looked. Unnerved by such gross inattention, I ambled over. One sign pointed on to the "Oregon Caves." Another pointed back to "Bigelow Lk." But the wooden markers that stunned me were the two pointing east down a fine broad path to the "Boundary Trail." We had taken the wrong trail! We had already hiked too far for further exploration. Uneasily we decided to continue on down to Bigelow Lakes and set up camp for the night. Before we lost our way again. The following morning, if not too disoriented, we might just try dayhiking back to this spot and following the markers to the Boundary Trail. Presumably then we would finally arrive at the lost campsite and discover what might have been. From a rocky overlook we identified a pale rock slide scarring the cliff just above large Bigelow Lake. After plodding down the long switchbacks through the forest to the meadow again, we cross-countried straight for the slide. Once we knew where we were headed, cow paths meandering across the grassy hummocks became obvious trails, and we soon arrived at the lake's marshy eastern shore. Just across the inlet stream we found a good campsite nestled beneath a rounded granite outcropping in a clump of red firs and hemlock (N 42 05' 17.6", W 123 22' 14.5"). We set up the tent beside the water near an established, although not recently used, fire ring. The lake was uniformly shallow. Yellow flowers and broad pads of water lilies floating over much of the surface. Birds flitted everywhere. Barbara pointed out one fat olive-sided flycatcher serenading our camp from the dead branches of a tall fir. After dinner we explored. 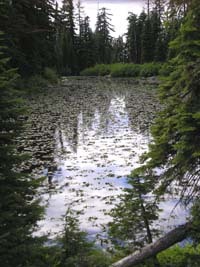 The second, much smaller lake was hidden by woods further west. Both shallow lake bowls had been gouged by glaciers out of granite bedrock, then dammed by a terminal moraine when the glaciers receded. Now both were filling with sediment and, in a blink of the geological eye, would become meadow. The moist soil of the valley bottom supported a verdant biodiversity. Buried behind the towering south wall lay the marble batholith that had been eroded by acidic flows of water into the Oregon Caves. Barbara loved the lush valley and spent the evening watching birds. Though easily accessible from the trailhead, the place seemed remote and secluded. We heard no voices, saw no one else, and agreed that Bigelow Lakes might make a fine future destination when more aggressive hikes came to exceed our abilities. Wednesday morning started out beautiful, with few clouds. We took our time. Just as we finished breakfast, however, it started to sprinkle, and then became windy, cold, and overcast. The weather radio had changed its tune and now forecast rain. We packed up in a steady drizzle, regretting not being able to stay a second night. The rain had let up by the time we rejoined the main trail. Leaving our backpacks concealed in the brush, we stuffed rain gear into daypacks and hiked back up the six long switchbacks to the saddle 350 feet above. Then we followed the arrows down the wide new path that did not appear on our outdated map. 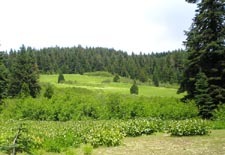 This fine trail skirted the large meadow of false hellebore that I had waded through three days earlier, bouncing from its edge at the return of each of ten long switchbacks carved into the steep forested slope. The new trail took more than a mile to descend the 450 feet that the old trail had dropped in less than half a mile. Near the bottom we crossed some boggy seeps, but nothing that would have served as a water source. At the junction with the Boundary Trail we found the lost campsite. It brought no hallelujahs. The cows were long gone, as was any sign of recent human habitation. Remaining instead was the devastation that cattle and horses had wrought upon the ground, where ignorant hooves had dug and scraped and scarified. Dung mixed with the dusty soil in mounds and indestructible brown pies. Barely a square foot had not been trampled, furrowed, excavated, and defecated upon. This was not the beautiful campsite of our dreams. From the naked post that marked the junction, we could look up to the yellow-green meadow of Corn Lilies and the shady island of forest where Barbara had waited while I searched for the worthless campsite behind us.We had been so close! I found a barren scratch of the old trail rising into the impenetrable copse of willows. It matched the scratch I had explored above. It was a trail. And a dry wash. Rain and snow continued to erode it into an ever-widening arroyo. The Forest Service had wisely relocated it for environmental reasons. An abandoned fire ring lay half-buried near the old trail. There we quietly ate lunch. We did not bother exploring further north along the Boundary Trail to locate and verify a spring. We had seen enough of the promised land. Wednesday evening we rented a motel room in Cave Junction and gazed back at the fog and clouds smothering the peaks of the Grayback Range. No doubt it was raining in the Bigelow Valley. We tromped to dinner along concrete pavement swallowed by the roar, fumes, and confusion of highway traffic. At a bright plastic table we ate beneath fluorescent lights. Too many people came and went. The magic was fading. As darkness fell unheeded, we drew the drapes, clicked on incandescent lights, and from its manila envelope unfolded the crisp new map across the bed. The direct old route up from Bigelow Lakes and down the dry wash was gone. Erased. Canceled. Annulled. Nor did Sparlin's Cutoff appear, but then, why should it? Instead, the new, rerouted path to the Boundary Trail zig-zagged through the woods far from sensitive mountain meadows. Just as we had walked it earlier that day, a thousand years ago. As remote as a line on a sheet of paper.